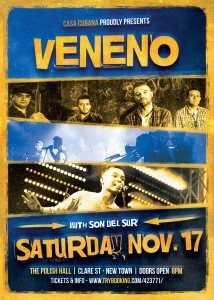 VENENO has been Australia’s leading Latino Fusion outfit since 1998. With a sound and musicianship like no other, this life-long brotherhood of Australian/Latino musicians push the boundaries with their infectious blend of Afro, Salsa, Reggae, Timba, Cumbia, Reggaeton, Hip hop and Rock. 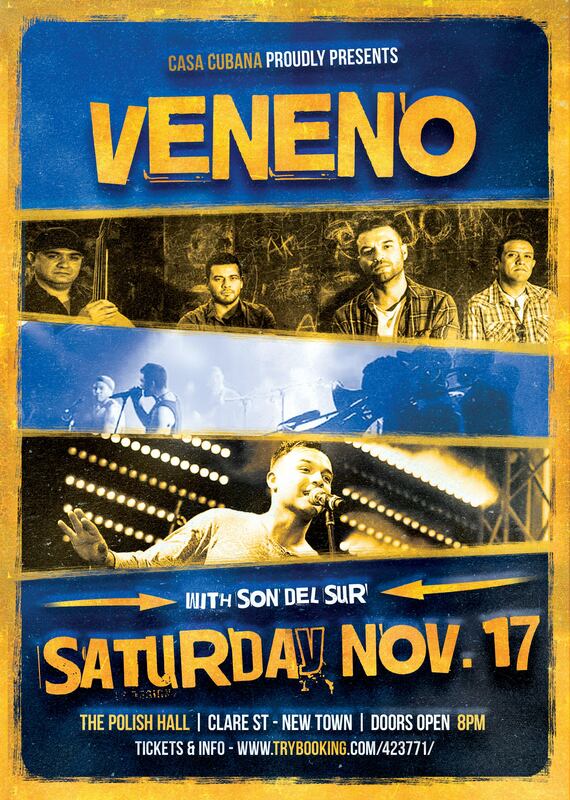 Veneno has also collaborated with acclaimed artists such as: Osvaldo Chacon/Bamboleo (Cuba), Aloe Blacc (USA), Cubanisimo (Cuba), Los De Abajo (MEX), and Havana Meets Kingston. Front man C Major (Carlos Velazquez) dominates the stage with charisma and flawless vocals, adding his own mix of RnB, Pop, Neo-Soul and authentic Latin Sonero traditions. C Major was seen on The Voice Australia and mentored by Latino Superstar Ricky Martin and Pop icon Will.i.am. Supporting Veneno is Hobart’s very own and much-loved Latin ensemble, Son Del Sur. We will also have special guests El Moro and Angel from Buena Vista Dance (Sydney) joining us for the night. Yep, we are going big! This is set to be a night to remember!